WELCOME TO RESURRECTION LUTHERAN CHURCH! Sunday school starts the morning at 9:00 am with worship at 10:00 am. If you have been visiting and worshipping with us and are interested in becoming a part of our faith community, please speak with pastor. Coffee fellowship follows the service so please come and join us. 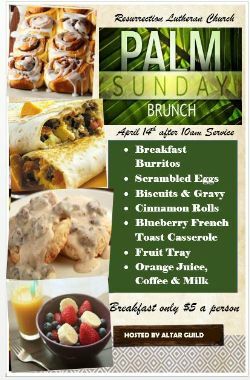 PALM SUNDAY BRUNCH April 14th – Altar Guild is hosting a wonderful brunch following the service today. Suggested donations $5 per person or $20 per family. Come with an appetite! SANDWICH SATURDAY – APRIL 27th at 9:30 am. Come help make sandwiches for the homeless. CONGREGATIONAL MEETING - APRIL 28th Following the service. End of Year reports will be presented and received. FAMILY PROMISE VOLUNTEER TRAINING – MAY 4th. LOOKING AHEAD- MARK YOUR CALENDARS MAY 5th The committee is working on a celebration for our 60th Anniversary Celebration. Bishop Roger Gustafson will be preaching and a luncheon will follow the service. This is an RSVP event-no charge but a free-will offering will be accepted. Sign-up sheet is on the shelf. We will all wear our new RLC tshirts. Come be a part of our history! Wonderful Palm Sunday Brunch! Have an appetite after service.